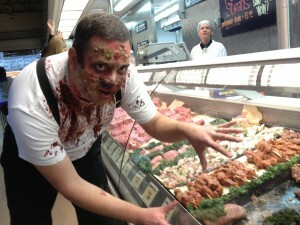 Zombie Invasion of Central Market caps first weekend of TCMF! The program featured a diverse and entertaining lineup spanning the musical spectrum, and introduced several out of town performers to the Austin audience, including songwriter Tami Hix, who traveled from Dallas for a number of showcase performances throghout the afternoon. Silver Thistle Pipes and Drums kicked off the show – it was their eighth year performing at TCMF – followed by another hard-rocking set by low brass ensemble Trombonium Sinfonium, who traveled from Greenville, TX, to perform at TCMF for their second straight year. They also were the first band this year to play the pop sensation “Gagnam Style,” much to the surprise and delight of the audience. Boss Street Brass Band hit the Central Market area with a wall of sound and a ton of funk, as they brought their New Orleans style brass band set hard and loud, recruiting what might have been the world’s youngest spontaneous second line on the CM Cafe patio. Kunitan returned to TCMF and presented an inspiring set of South American/Andean folk music, followed by Bobby Davis and the Austin Jazz Band, featuring vocals from longtime TCMF favorite Lisa Clark. The audience was then treated to a fabulous and varied set of beautifully performed brass music by TCMF newcomers Hill Country Brass, members of which traveled from as far away as Victoria to perform. 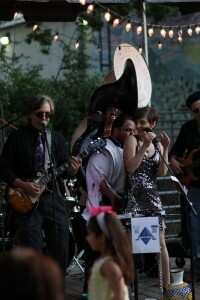 Blue Diamond’s lead singer is bitten by DMCB zombie… ONLY AT TCMF! including … ZOMBIES, who began to appear one by one around the Central Market area — even the meat market — in their quest for entertainment. Before the Blue Diamonds could finish their set, their set was overrun by nearly two dozen zombies, Austin’s own Dead Music Capital Band, who may have bitten a few of the Blue Diamonds, but then put on a rousing set in their own inimitable style, leaving music lovers and many of their own body parts in their wake! The festival continues at Central Market Monday and Tuesday evenings before shifting to the Farmer’s Market at the Triangle on Wednesday. Check the schedule page for full details!